UPPER EAST SIDE — The Second Avenue subway hit a major milestone on Thursday: A 485-ton, 450-foot-long tunnel boring machine reached the Lexington Avenue-63rd Street station to complete the tunnel for the $4.45 billion Phase 1 of the project that will extend the Q line from East 63rd up to 96th street. 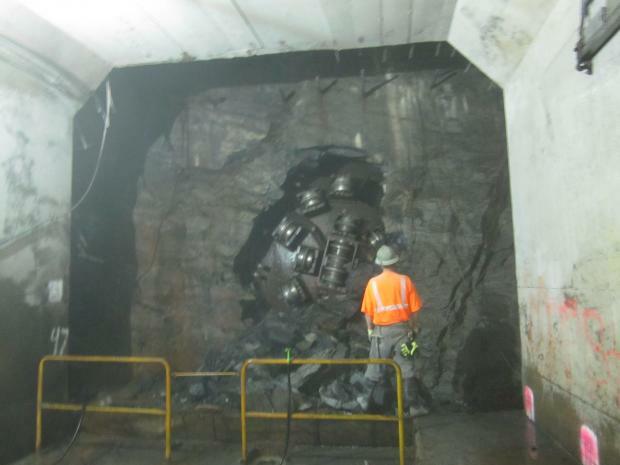 The machine, with its 22-foot diameter cutterhead, mined 7,789 feet, averaged 60 feet a day since starting at East 92nd Street in May 2010 before it burst through to an existing tunnel on Tuesday in front of scores of MTA workers and contractors who were excited to witness a chunk of history. “You come down here and see the Second Avenue subway taking shape before your eyes,” said MTA Chair Jay Walder. The Second Avenue elevated line came down in the 1940s, and the East Side has long been awaiting a replacement. MTA officials expect the new line to decrease overcrowding on the Lexington Avenue line by 13 percent, or 23,500 people on an average weekday. Travel times for those on the far East Side, or those going from the East Side to Midtown, are expect to be slashed by at least 10 minutes. Walder acknowledged the chaos it has been causing for residents and businesses above ground, but said they have been trying to mitigate problems. “We continue to work with residents in every way we can," he said. He and MTA Capital Construction President Michael Horodniceanu also said that Phase 1 would be completed on time and on budget. The completion of the tunnel does not mean that the blasting is over. The subway stations for East 96th, 86th and 72nd streets still need to be built. The contract for East 86th Street was awarded just last week. But Horodniceanu said the hardest part was over. Over the next three weeks, the tunnel boring machine will be pulled back to East 92nd Street by locomotive and partially disassembled. Then it will go back to the shop before moving on to a big project in Indiana, said Chris Confrey, of Local 14-14B of the International Union of Operating Engineers. “It is truly a break through for the community,” said M. Barry Schneider, who chairs Community Board 8’s Second Avenue Subway Task Force and, like many others, brought his camera to capture the event. As the machine carved its way through the rock — causing a huge plume of dust that workers hosed down — and reared its head, Schneider joked, “It’s a boy!” and then corrected himself. It was actually a girl named Adi, he said. The workers named her after Horodniceanu’s granddaughter. At least 30 businesses have closed in the subway’s construction path and business owners continue to call on elected officials to help come up with solutions to help them, such as creating a special business zone. The tunnel will now receive a concrete line to provide its permanent structure. This project was part of the subway's initial $392 million contract awarded in 2007 to Skanska, Schiavone and Shea Tunnel Constructors.